I tend to get a little excited about birthdays. I love making cakes for my loved ones and friends and when it comes to my birthday, I love to make myself a cake too. Last year I baked two cakes for my birthday. The previous year I baked the fantastic Winning Hearts and Minds cake from Orangette. The year before that I made two kinds of cupcakes for a karaoke and shuffleboard party at the local legion (which I transported there via bike). And before that I made a yellow cake layered with lemon curd and drizzled with dark chocolate ganache. Really, if it’s not obvious already, I have no problem baking for myself. Not at all. It’s usually a big decision on what kind of cake to make. I cast my net wide and then narrow down the choices until I’ve found something perfect. This year, however, I had it all figured out. The week before my birthday, Cornelius and I went out for dinner at a local diner – the kind of diner with formica countertops, comfy booths and where you probably should order pie, except we never do. So as we walked to the cashier to pay our bill, I saw the most wonderful looking chocolate cake in the display case. The cake was skyscraper high and covered in the fluffiest white frosting. I kicked myself for days for not ordering that chocolate cake. My cake fate was sealed. One chocolate cake coming up! Chocolate cakes can be tricky. Sometimes they’re dry or just not very special tasting. I wanted a cake with a wow factor and luckily, I had one cake bookmarked for years that I was eager to try. The black magic cake by Hershey’s always seemed to get rave reviews and the truth of it is, I liked the name. Not to mention that the recipe is as easy as….cake. I think the key to the magic is the coffee as it helps to deepen the chocolate flavour. I made sure to make mine extra strong and used instant Italian espresso powder – 3 teaspoons to one cup of boiling water. I dunno if that was the trick, but this cake was amazingly flavourful and moist. This is, in my mind, the most perfect chocolate cake! As for decorating, I usually keep things simple. But this year, I was kind of smitten with ruffles. I hate ruffles on dresses and blouses, but I do love them on cakes. Sweetapolita had a gorgeous one and then Thus Bakes Zarathustra (sadly now defunct) made it look simple – just some zig-zags. I could do that! Unfortunately, you need a proper cake decorating tip and because I have a pathetic collection of 4 tips found at a garage sale, I didn’t have the proper one. But, I was eager and didn’t let it stop me. I was gonna make a pretty cake or a pretty ugly cake – I was willing to take either option. Unfortunately, it was the latter and looked more like noodles than ruffles, but I was okay with that. The frosting? Just a simple vanilla buttercream with real vanilla. It was buttery and sweet and with the chocolate cake tasted like a giant Oreo cookie in the best possible way. I loved it and so did all my friends who happily ate up their slice. elsewhere: Maybe you don’t want to think about cake (you’re crazy). Maybe you’re concentrating on dinner, if so, head to Poppytalk and check out my steamed fish with kale. It’s healthy and delicious and it makes it easy to have cake for dessert. You know, if you really do want cake. Heat oven to 375F. Butter and flour two eight-inch cake pans and set aside. In a large bowl, combine the sugar through to the salt. In another bowl, whisk together the remaining ingredients. Pour the wet into the dry and mix well with a stand mixer or a wooden spoon. Pour the batter evenly into the 2 prepared pans. Bake for 30 – 40 minutes or until a cake tester inserted into the centre of the cake comes out clean. Cool on wire racks for 10 minutes before inverting the cakes onto wire racks to cool completely. Mix the sugar with the butter and cream cheese until well blended and fluffy. Cut the vanilla bean in half, length-wise and scrape the seeds into the frosting. Add in the salt and vanilla and beat until well mixed. When cake is completely cool, you can start frosting the cake. If your cake is a bit domed on top, you can slice it off using a serrated knife so you have a nice even top. Luckily my cake wasn’t domed so I was able to spread the frosting on one cake before placing the second cake on top. I then used a thin layer of frosting to do the whole cake (called a crumb layer – because here is where you’ll catch any stray crumbs). Then frost and decorate the whole cake however you choose. Oh – did I wish you an early happy birthday some time ago? I think I did. If I didn’t…happy birthday!! x. Now that’s a cake! I love baking b-day cakes for people and myself as well! Yeah, that cake looks pretty amazingly lovely! (It takes a special cake to get me excited.) Happy Birthday to you, lovely lady! I love baking for myself on my birthday! It means that I’ll absolutely get the cake that I want (and I’ll get to lick the bowl…score). Black magic sounds good to me! That deep dark chocolate with the luscious vanilla buttercream…swoon! You baked yourself the gorgeous cake you deserve! Happiest of happy birthdays. i love this! i have salivated over both cakes at sweetapolita (that pink!) and thus bakes (just gorgeous!) and i rather like the ruggedness that yours has with the thicker icing zigs and zags. 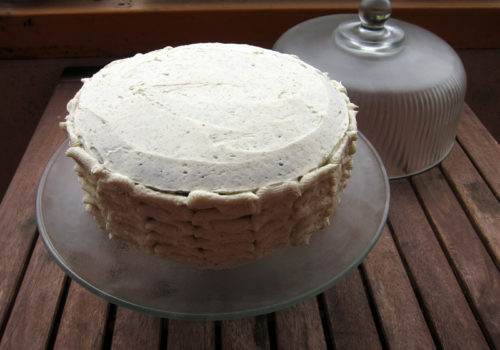 it fits with the speckled buttercream & the side view of the cut piece looks amazing. great job!!! i really want to try this technique, but need to get another couple of round cake pans. im holding off because i have registered for them….but have seen so many pretty cakes lately im *so* tempted to buckle! Great looking cake – a girl must have chocolate on her birthday! I have cake on the brain too, but I have no way to bake it. We’re still in a vacation rental before heading on our long road trip this weekend, and can finally move into… wait for it… another vacation rental while we search for a home to buy! Love it. Soon we’ll have a proper kitchen with proper baking utensils, pans and ingredients. I’ll need an appropriately grand cake to break it in. That looks SO GOOD! I love the elegance and simplicity of the crisp vanilla buttercream against that near-black cake. I’ll add it to my list of chocolate layer cake recipes. PS – how on earth do you manage transporting cupcakes by bike?? I managed to crush a batch to smithereens when I tried to bike them somewhere, though I suspect Amsterdam’s cobblestone streets might have played a part in their demise. But that vanilla buttercream looks gorgeous so I’m going to try it on the cake this weekend for my little boy’s 4th BDay party. And your cake there is really lovely. Kind of basket weave-y. Me and frosting, we don’t always get along and my cakes end up having to hide under sprinkles or flower petals or cocoa powder or somesuch. awww was it your birthday? happy birthday sweetie! you made a fabulous cake. perfect buttercream. i might have to use this as i have never made a vanilla “bean” buttercream. and i LOVE having hot coffee with my cake too!! What a beautiful cake! My birthday is coming up in a couple of weeks and I am thinking of baking my own cake… glad to know I’m not the only one!! Guess what I’m veganizing next week? That baby up there! Shirleen, well, I think this is your kind of cake! And yes you did – my birthday was May 8th & you were actually the FIRST person to wish me! Thank you!! Aynsavoy, I bought some vanilla beans a while ago and was just itching to use them up. This is what I call a very good use of the beans. Though ice cream would also serve well. Cory, thank you for praising my rugged and sturdy ruffles 🙂 I only have one cake pan, so the oven was on longer than it should have been. Maybe I’ll get myself some proper cake pans too! Heather good luck with house-hunting! Enjoy all the upcoming fun!! Rach, this is such a good cake recipe. And thank you for the inspiration. As for the cupcake transport – the key is no bumps. Luckily there aren’t many cobblestones here. 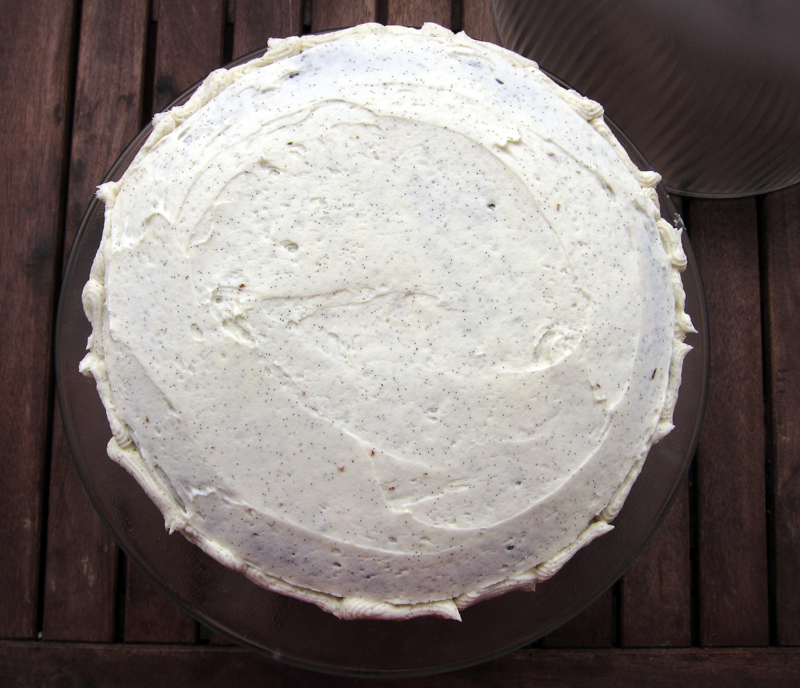 Danabee, I’ve made a similar frosting to that sturdy whipped cream for my red ale cake on this site. It’s delicious and it would be great with this cake too. Have a great weekend!! Thanks vanillasugar, it was! 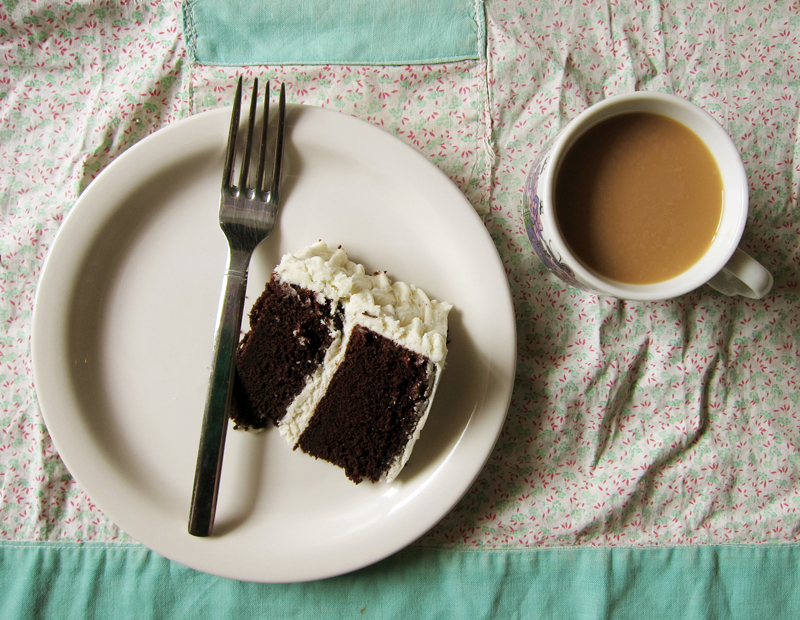 Thanks and coffee and cake are perfect partners, aren’t they? Rachel, do it. 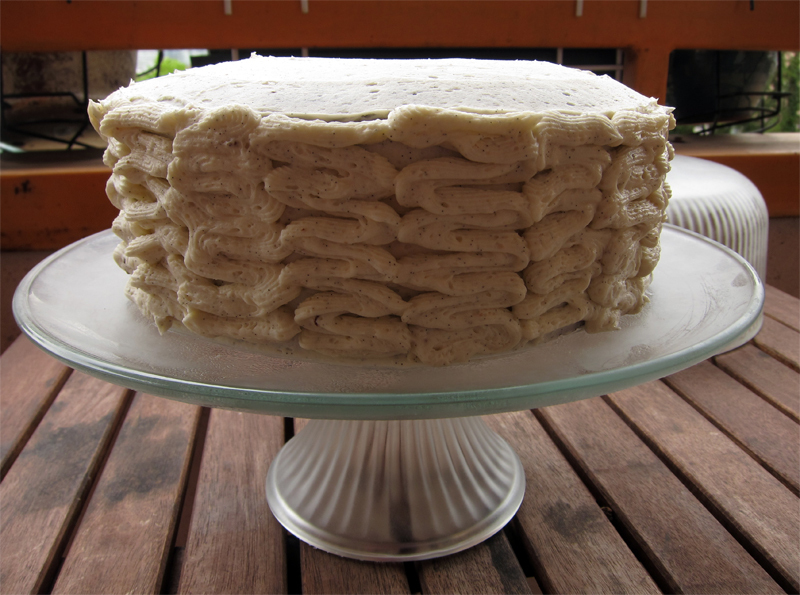 I love baking my own cake – and cakes for other people’s birthday. I’m no snob! Kali, let me know how it goes!! Aw, Rach, thanks for the tip. I should have tried that – looks gorgeous! Happy birthday! Happy cakes! Love the vanilla ruffles! If I had a cake like that, I’d be excited about birthdays too! Happy Birthday! So my birthday is Sunday… should I make this Saturday evening (and will it need refrigeration if I do?) or, should I wait till Sunday to make it? Thanks Bijoux. Is masking some kind of technical term? Phyllis, I’d bake the cake on Saturday and then frost the cake on Sunday – that way the cake is cool. I’d refrigerate the cake and then it can stay out on Sunday (unless it’s really hot where you are). Thanks for your answer. After I got to thinking about this… I had decided to do exactly as you said, bake saturday and frost sunday. Well, except for refrigerating overnight. Your cake is beautiful!!! Happy belated birthday, and here’s to a great year ahead. Phyllis, glad I could help! Let me know how you like the cake. I’m totally behind on blogs, and twitter and all sorts of other things, so happy belated birthday! I didn’t know ours were so close! Those flecks of vanilla bean in the frosting look heavenly. Happy belated birthday! this is not a sandwich. please stay true to your goal and remove all cake posts. Thinking about making cupcakes out of the recipe! Any tips on yields or bake times? I’d check times at about 20-25 minutes to see how it’s doing, Naomi! Let me know how it goes!